Rev. Judy Beaumont, Roman Catholic Woman Priest Presides at Magdala Celebration On Thursday July 18th,2013 Southwest Florida Call To Action members and friends gathered to celebrate the Eighth Annual Magdala Celebration. Eighteen enthusiastic and thoughtful participants included representatives of Pax Christi, Rev. Joe Irvin’s Bootstrap Ministry of Cape Coral, the Mary Mother of Jesus Inclusive Catholic Community in Sarasota, and the Good Shepherd Inclusive Catholic Community of Fort Myers where Judy Beaumont,and Judy Lee, Roman Catholic Women Priests are Co-Pastors. Rev. 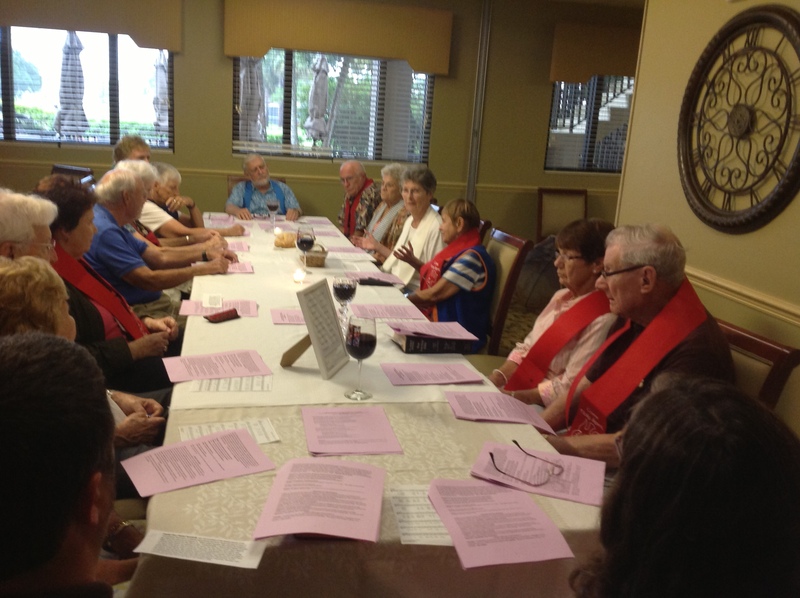 Judy Beaumont put together and led an inspiring liturgy that celebrated Mary of Magdala as Apostol to the Apostles and other woman leaders noted in the Scriptures as well as the nineteen women who were auditors at Vatican II. These diverse women were called to represent the world-wide church born anew in the promise of the Council. They paved the way for female theologians and for the increased participation of women in the life of the church. Mike and Imogene Rigdon of Venice led the group in a rousing chorus of “Standing On The Shoulders” written by Joyce Rouse. As they sang “Standing on the shoulders of the ones who came before us, we are stronger for their courage,we are wiser for their words…” each one present recalled the people in their lives, well known and unknown, who led the way for the new and sometimes revolutionary roles of women and the laity in the church. The shared homily included these reflections. Cardinal Leo Suenans was remembered as one of the Bishops who spoke at the Council of calling for the participation of ” the other 50% of the human race”. Some also remembered pre-Vatican II Catholic Action Movements including Pat and Patty Crowley and their Catholic Action and Christian Family Movement. All of this paved the way for Call To Action to form in Chicago in the late 1970’s. Reflections included the sentiment that the shoulders of those present would be there “to hold the ones who follow us”. Judy Beaumont presided at the Eucharist and all said the words of consecration and wore stoles to symbolize the priesthood of all believers. The assembled closed with blessing one another, asking the Spirit of God to aid them to “warm frozen hearts and subvert frozen structures for the sake of the Kin-dom.